Angels & Demons, starring Tom Hanks, is the top grossing film so far in 2009 and is, of course, based on the novel by Dan Brown. Thanks to the success of the movie, the book is enjoying a resurgence and is back on top best-seller lists. 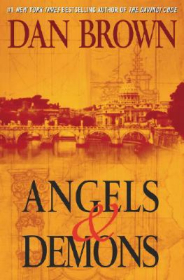 Angels & Demons, which was published before The Da Vinci Code, introduces Robert Langdon, a Harvard professor of religious symbology. Langdon is summoned to CERN in Switzerland when a scientist there is murdered and branded with the symbol of the Illuminati, a secret society thought to be defunct. In Switzerland, Langdon meets Vittoria Vetra, the daughter of the murdered physicist, and they discover that a container of highly explosive antimatter has been stolen. The Illuminati are claiming to have hidden the antimatter somewhere in Vatican City during a papal conclave and kidnapped four of the cardinals up for election to pope. Langdon and Vetra have only hours to search through the Vatican archives and the city of Rome to find the Illuminati and stop the destruction of Vatican City. From the first chapter, Angels & Demons is non-stop action and adventure that weaves together themes of science, religion, and history. Most of the action takes place in Rome’s famous landmarks, and the discussion of their history and architecture make me want to visit Rome in person. My only complaint is about a death-defying stunt at the end of the book that is just so over the top it’s ridiculous. Lately, this happens all the time in books and movies and I’m all for suspension of disbelief, but give me a break. Still, I enjoyed the book immensely and I think anyone who enjoys action, conspiracy theories, or secret societies will enjoy it too. Buy Angels & Demons by on Amazon by clicking here  . Copyright © 2009 Daemon's Books. All rights reserved.